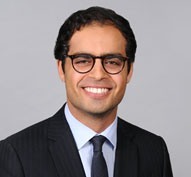 Gibson Dunn | Soleimani, Jonathan N.
Jonathan N. Soleimani is an associate in the Los Angeles office of Gibson, Dunn & Crutcher. From 2015 to 2016, Mr. Soleimani served as a law clerk for the Honorable Christina A. Snyder of the United States District Court for the Central District of California. Mr. Soleimani earned his law degree from Yale Law School. While at Yale, Mr. Soleimani was Co-Editor-in-Chief of the Yale Law & Policy Review, a member of the San Francisco Affirmative Litigation Project, and a Fellow of the Information Society Project at Yale Law School. In addition, he served as a judicial extern to the Honorable Justice Dalveer Bhandari of the Supreme Court of India. In 2006, Mr. Soleimani graduated with highest honors from the University of California, Berkeley, with a B.A. in Political Economy. He also received his B.S. in Business Administration from Berkeley’s Haas School of Business, where he graduated first in his class and was awarded the Departmental Citation. Before entering law school, Mr. Soleimani taught high school biology in South Los Angeles as a Teach For America corps member. Mr. Soleimani is admitted to practice law in the State of California and currently practices in the firm’s Litigation Department.